Lord Shiva is Bhola Nath, one who is easily pleased. Intense yearning suffused with devotion and faith wins His heart. Every devotee who flocks to Prasanthi Nilayam to celebrate the The Sacred Vigil on Shivarathri Night in the Divine Presence will have his or her version of this immense mercy and bounteous Love of Lord Shiva. Read on for an account by Dr. A. Ranga Rao whose family was tested thoroughly of their yearning and devotion before being given the taste of the nectarous Divine Presence of Lord Shiva in Prasanthi Nilayam, as published in Sanathana Sarathi. Feb 1969. We yearned long to witness the Sivaratri Festival and last year, we started from Madras, in the early hours of the previous day itself, in our car. 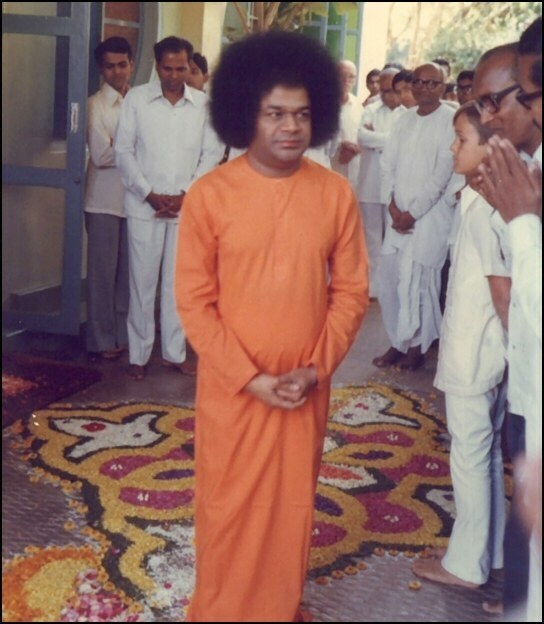 We thought we could reach the Presence of Sathya Sai Baba, Prasanthi Nilayam by 5. P. M., and have His Darshan in the evening. To our bad luck, the car started giving trouble. The engine was getting too hot and every ten miles, the car came to a stop! We had to wait in the hot sun for hours, every time, for the engine to cool down. Imagine our plight when we realised at 10 P. M., that we had covered only 70 miles, through that hapless vehicle! Fortunately, we were able to secure the services of a good mechanic, who set to work, pretty quick; but, he too could not set the car on her wheels again, before 5 A. M., on Sivaratri day! We were at Ranipet, then; all hopes of being present at the magnificent and inspiring flag Hoisting Function at the Nilayam were blown away. Nevertheless, from the smooth running of our car, we were confident we could be at the Holy Kshetra by 11 A. M., in time for the Vibhuti Abhishekam, if all goes well. The milestones were flying past quite fast. We were in quite a happy mood, singing Bhajan. Then, the petrol pump gave us the slip; it failed. Twelve miles after Chikballapur the car came to a halt! The poor thing had taken us merrily on many occasions to the Nilayam from Madras; but, this day, it was haunted by a series of mishaps. Other cars were racing along the road, with devotees anxious to reach the Lord’s Presence. Some noticed us; many did not. One car stopped; the chauffeur walked towards our car and attempted to set it right in all earnestness. Suddenly, to our utter consternation, the petrol caught fire. Big tongues of flame were rising to the skies. The friendly driver was caught in the flames, but, he jumped out in the nick of time, and saved himself. His dhoti was on fire; he managed to scotch the flames and get back to his car. I lost all hope of the vehicle, I was all in a shiver. It was impossible to put out the fire. But, my friend, Kameswara Rao, called out Sai Ram, Sai Ram, most piteously. He threw three handfuls of road dust on the ghastly flames. And, the miracle happened. The fire became extinct and the car was free from any sign of fire! Master of all the Elements, Baba heard the agony and ordered the Fire to leave the car alone! It obeyed. We gave the driver some money and a Dhoti to wear; he was too dazed at the miraculous extinction of petrol flames, for, he knew that the tank was full of the combustible stuff. I boarded a bus that took me back, twelve miles and I got a mechanic from there, to repair the petrol pump. He brought all the implements necessary for the operation, and started his work, promising to restore the car to perfection, in half an hour. But, his treatment went on, endlessly. It was 3 o’ clock already and he was still twiddling. By 3-30 P. M., we got desperate again. Cars sped past us, towards the Nilayam. One party took pity on us and gave us some coffee from their flasks, saying, “Take this; it is sent by Baba!” It was such a welcome refresher. For, we were really very thirsty and very hungry. They offered to take us along with them and pressed us to get into their car; but, there was no one except a milestone to whom we could entrust that car of ours! I told those kind friends, just to persuade them to proceed, “Don’t worry; Baba will not start the evening meeting, until we arrive. He would certainly take us there to witness His Glory, the Lingodbhava.” They left us, with a heavy heart. Meanwhile, time was flying. It was 5 P. M. It was 5-30 P. M. And, there were still a little over 50 miles to go, driving that recalcitrant car. All hopes of seeing the Lingodbhava Vanished. Suddenly, the pump began working. The mechanic smiled, though it was working only intermittently. I requested him to sit in the dicky, and shake the pump, whenever it stopped working. I sat at the wheel, and the car moved. It was a fine show, for all we met on road! Nevertheless, in spells of spurts tossed between hope and despair, the car brought us to Prasanthi Nilayam, racing over the 50 miles in -would you believe it? – sixty minutes! Another miracle of Baba! As we sat in the front rows facing Baba, tears of gratitude welled from my heart. “Lord,” I said within myself, “while thousands and, thousands of devotees were singing and adoring You here, You heard our anguish, and stopped the fire to save the car, and brought us in time to see Your Glory. We were feeling Your Presence and Grace, every inch of the road”. The friends who brought the Coffee for us and who had tried to bring us to the Nilayam were sitting just behind us; they congratulated us with their meaningful gestures. We saw the Lingodbhava, from our Lord; we sang enthusiastically and with a contented heart, for within minutes, the mechanic came to us and said that, the car was perfectly O. K.